Although the scope of this work does not include the very complex problem involved in the working of a great mine, prospecting and the simpler mining operations are so intimately connected that it would not be desirable to make mention of the one and ignore the other, because the prospector must perforce become a miner as soon as he discovers mineral, even though his operations should not go beyond a shallow trial shaft. The simplest method of hoisting dirt or rock out of a shaft, after it has become too deep for the sinker to throw the stuff out with a spade, is by a bucket and windlass, which may be either single or double, according to the power required. In northwestern Canada, where the present gold excitement has attracted so many thousand pioneers, the miners have hitherto been content with a windlass. For their purpose it answers well, as they sink through gravel and not more than thirty feet at the most before reaching the bed rock. The alluvial flats in which the coarse gold of the upper Yukon has been discovered, are composed of gravel that is invariably frozen, summer as well as winter, and which requires to be thawed out before it can be worked with a pick. Strangely enough, dynamite cannot be used, as the ground is so elastic under the frost that the tamping simply blows out and the required effect is not produced. This peculiar condition has led the men, who are mining in that part of the continent, to adopt methods very similar to those used in Siberia, where, also, the ground is permanently frozen to a great depth. After scratching the surface of the soil, and removing the deep moss that invariably covers it, they light large fires over night and in the morning remove the few inches of thawed soil underneath the ashes. By this painfully slow method they eventually sink to the richer gravel, fifteen or twenty, or even thirty, feet below the surface, though there are few shafts of this depth on the Klondike and the other gold-bearing creeks about which we have heard so much. When the bed rock is reached and the few inches of decayed surface removed, the miner builds his fire against the side of the shaft, placing some inclined logs over it as a roof, and goes to bed. When he awakes next day several feet of the soil have fallen down over the logs, and this he has to hoist. It is at this stage that the windlass worked by his companion, or partner, demonstrates its value. In a very short time all the gravel that the fire has thawed out is hoisted to the surface, and added to the dump, where it must remain until the warmth of summer shall have thawed the streams and permitted sluicing. A sluice is really nothing more nor less than a trough, open at the top, in which the gold is sorted from the lighter gravel and dirt by running water. The grade varies according to the coarseness of the gold. Very fine gold would be carried away by too swift a current, while coarse gold will resist almost a torrent. The sluice is built in joints, usually a dozen feet in length; the sides may be six inches or a foot deep, and the width varies from one to two feet. There is no rule in this matter, but owing to the extravagant price of lumber--as much as a hundred and fifty dollars a thousand feet, board measure--the tendency is to make the sluices very small and very short, thereby saving nothing but the very coarsest gold. A properly constructed sluice should be several hundred feet in length, and the inclination should not be more than one foot in twelve, while it may, in a case of fine gold, be advisable to diminish this inclination by at least a fourth. 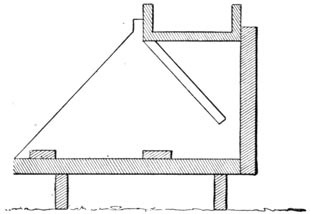 Riffles, or cross-pieces, are placed across the sluice at intervals of a few feet, and slats are placed lengthwise, filling up the intervals between the riffles. Into the crevices and interstices of these obstructions the heavy gold sinks by its own weight, and every few days, or weeks, as the case may warrant, the miner shuts off the water by closing the gate at the head of the sluice, removes the slats and riffles, beginning at the joint nearest the head and working towards the tail of the sluiceway, and collects all the gold that has accumulated. This is a very simple form of mining, but it is not the simplest. Much gold has been recovered from the gravel in which nature has placed it by the aid of the pan, a sheet iron dish modeled on the housewife's bread pan. Next to the pan the cradle is as little complicated as anything used in the winning of gold. After this comes the long tom, a considerable improvement upon the cradle, but it necessitates more water and more men. The horse whim is used in developing many a western prospect. The windlass does not work well below forty feet, and where fuel and water are to be had any sensible man will use steam power for deep mining, but there is a gap between the windlass and the steam hoist which the horse whim fills acceptably. To a depth of 300 feet a horse whim can usually handle the rock and water. It is inexpensive, in the first outlay, and costs but little to run. You can bring your bucket from a shaft a hundred and fifty feet deep in two and a half minutes, and with a seven hundred pound capacity in the bucket, in forty-five trips you could raise fifteen tons a day. A shaft three hundred feet deep would require four hours' steady work to bring to surface the same amount. A fair speed with a one-horse whim from a three hundred foot shaft is one hundred buckets per shift of ten hours, but the prospector rarely has to figure on shafts of that depth. If the mine turns out well it is likely to be in the hands of a powerful company (of which he should be the principal shareholder) before the three hundred foot level is reached. The weight of the horse whim is about eight hundred pounds. It can be taken to pieces and packed anywhere that a mule can travel; the heaviest piece will not weigh more than a hundred pounds. Total weight 1,500 pounds. Weight of heaviest piece 350 pounds. Weight of stamp 100 pounds. Drops per minute 60 to 80. Capacity per hour 300 to 400 pounds. Diameter of pulley 30 inches. Price, with horse power, about $350. A diamond drill is a most useful adjunct to exploration of a mine or deposit. It is, essentially, a hollow drill which may be lengthened at will, rotating rapidly and carrying a crown of "bort" or black diamonds at its extremity, that eats into the strata very quickly. Holes 3,000 feet deep have been driven by the diamond drill, but such extensive investigations of the earth's crust are tremendously costly, and may only be undertaken by governments or rich companies. For a depth of 700 feet, however, the expense need not exceed $2,100. The cost of the plant for drilling would be $3,500 more. Water is pumped down the hollow center of the drill, to keep it cool. The great advantage of the diamond over the percussion drill is that it permits the saving of a core, so that the character of the rocks and minerals passed through may be known. The diamond drill does better work in hard strata than it does in soft. The rate, in limestone, may be about two feet an hour, down to a depth of 200 feet. A complete outfit for boring with the diamond drill includes a steam engine and boiler, diamond crown, lining tubes, rods, and various minor accessories. Hydraulic mining is the cheapest known method of recovering gold. In four years the North Bloomfield Mining Company of California worked 325,000,000 cubic yards, which yielded only 2.9 cents of gold per cubic yard, and realized some profit. Very poor gravel will pay when the conditions are good. Cheap water, grades of four inches in a hundred, ample dumping room, big banks of light gravel, large areas of deposits, labor at a dollar a day, and a clever superintendent, make a combination that will yield a profit out of three-cent gravel. Miners speak of "surface" and "deep" placers; of "hill claims;" of "bench claims" on the old river terraces; of "gulch diggings;" of "bar claims" on the sand bars of existing rivers; of "beach sands" or those that in a few favored localities border the ocean. A "sluice" is a long boxway to catch the gold; a "drift" is a tunnel into the gold-bearing gravel; and hydraulic diggings are those in which water under pressure is used to disintegrate the gravel. A ground-sluice is a trench cut through the bed rock. The roughness of the natural floor serves for riffles. Booming is a process requiring a large accumulation of water in a reservoir, which may be discharged at once, and carry all the material that has collected below the pass, with one full tide, into the sluices. This practice is extremely ancient; Pliny mentions it in his Natural History. Deep mining may be divided into drifting and hydraulic mining. In the former the metal is won by means of tunnels and drifts or horizontal passageways along the length of the deposit. It is usually resorted to in districts where a flow of lava has covered the gold-bearing gravel, and made hydraulic mining impossible. It is followed in Alaska for another reason, viz., because the constantly frozen ground will not permit of the more remunerative method. The gravel is carried to the mouth of the tunnel and there dumped to be washed in the sluices. When "cemented" it must be broken up by stamps. Rich deep placers may be worked by drifting, but whenever practicable hydraulicing is to be preferred as giving better results. It yields from four to six times the amount of gold that drifting does. Thorough exploration should precede the expenditure of large sums in a hydraulic plant. Even should the explorations result in finding barren gravels the money will have been well spent in saving the cost of an unproductive plant. Black sand (magnetic iron) almost always accompanies gold, but this alone is no sign that gold is present, as black sand may usually be obtained by grinding and washing crystalline rocks. Ditches and flumes of wood or metal are used to bring the water for hydraulic mining from the region where it was impounded in a catch basin, often a distance of many miles. It is said $100,000,000 have been invested in ditches and flumes, mining and agricultural, in the western states, and new flumes are being planned every month. Some of them consist of wrought iron pipe carried over ravines by trestles 250 feet high. In planning a ditch the miner must see to it that his water supply is at a sufficient elevation to command the ground. The more pressure the water works under the better. The supply should be continuous, or at least be available during the whole working season. Ditches in regions of deep snow should have a southern exposure. All streams crossed by the ditch should be diverted into it, to counteract leakage and other loss. Waste gates must be provided every half mile. Ditches are better than flumes. Narrow, deep, and steep ditches are to be preferred in mountainous regions, and the reverse in valleys with soft soil. Some Californian ditches with a capacity of 80 cubic feet per second and grades of 16 to 20 feet per mile have been built. Sometimes the face of the country requires flumes; they may even be hung along the face of a cliff. In shattered ground and where water is scarce flumes are better than ditches. The grade for a flume is usually 25 to 35 feet per mile and its capacity is smaller than that of a ditch. Pine planking 2-1/2 inches by 12 to 24 inches, and 12 feet long, is the dimension stuff generally preferred. 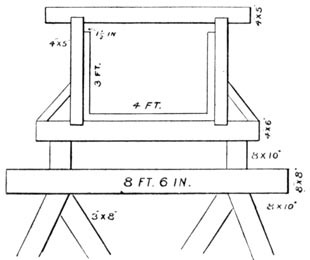 A flume 2 feet 6 inches square requires posts, caps, and sills of 3×4 inch; stringers 4×6 inch. Great care is needed at curves to avoid slack water and splashing. The boxes must be shortened and the outer side wedged up until the water flows as evenly as in the straight stretches. Should anchor ice form the water must be shut off at once. The life of a flume seldom exceeds a dozen years, whereas at the end of a similar period a ditch would be carrying 10 per cent more water than at first, owing to the sides and bottom having become consolidated. Wrought iron pipes are employed largely in California to replace ditches and flumes. When the pipe crosses a ravine it is known as an inverted siphon. Piping is also used to convey water from the "pressure box" to the "gates" and "nozzle." Wrought iron pipes have to stand pressure varying from 34 pounds to 800 pounds to the square inch. Air valves or blow-offs must be provided at intervals to allow the escape of air from the pipe while filling, and to prevent a collapse of the pipe after a break. A covering of coal-tar should be given the pipe both inside and out. Cost varies from one dollar to two dollars a running foot. The pressure box ends the ditch and from it the water passes into the supply pipe. The head of water is measured from this point. A box to catch sand and gravel, with a side opening and sunk below the level of the ditch, is called the "sand box." One and a half inch plank is generally the material out of which the pressure box is made. The depth of water in it is such that the mouth of the pipe is always under water. A grating in front of the pipe catches all rubbish. As no air must be allowed to get into the pipe the water must be kept quiet and deep at the pipe-head; this is insured by dividing the box into compartments, the first receiving the water and discharging it through suitable openings into the second. The water supply and the discharge should be equal. The water passes down the feed pipe, iron gates distributing it to the discharge pipes. Water must be turned on gradually, and the air valves must be open. The piping terminates in a nozzle with knuckle-joint and lateral movement. Nothing but the most secure bolting to heavy timber and the heavy weighting of the last length of pipe should be relied upon to keep the hydraulic giant in its place. Should it once begin bucking every man within reach of the powerful column of water is in imminent danger. The nozzle is directed by means of a larger deflecting nozzle, which receives the impact of the water and causes the main nozzle to swing right or left, up or down, as the case may demand. A derrick capable of moving heavy boulders, and driven by water power, is a necessity in all hydraulic mining. Masts 100 feet high and booms 90 feet long are sometimes used, the motive power coming from a "hurdy gurdy" direct impact wheel. Experiments have shown that the bucket has much to do with the power of the wheel. For instance, when the water impinged against a flat bucket the efficiency of the wheel was less than 45 per cent. of what it should have been in theory, whereas, with the Pelton bucket, it rose to 82.6 per cent. There is a great amount of so-called cement, or in other words consolidated gravel, in all the northern placers, and in many California deposits, as well. In the old Cariboo diggings on the upper Frazer, strong companies are now pulverizing the ancient cements that resisted all the efforts of the 59 miners with powder and stamp mill, and are deriving large profits therefrom. Black powder gives even better results than dynamite in gravel. The usual allowance of powder is 20 pounds in weight for every 1,000 cubic feet of ground to be moved. Make drifts T-shaped, and tamp the main drift almost to the junction with the arms, which should be parallel to the face it is required to dislodge. Sluice. Grade. Water. 6 ft. × 36 in. 4 to 5 p.c. 2,000 to 3,500 m. in. 4 ft. × 30 in. 4 p.c. 1,800 to 2,000 m. in. 3 ft. × 30 in. 1-1/2 p.c. 600 to 1,000 m. in. "The longer the better," is the sluice-builder's motto. The best "riffles" are made of blocks of pine 8 to 13 inches deep, wedged into the bottom of the sluices. They are laid in rows separated by a space of an inch or an inch and a half. Riffle strips keep them in position, these latter being laid crosswise on the bottom. When worn down to five inches, the blocks should be replaced. This amount of wear will probably require six months. Stone and longitudinal riffles running lengthwise of the box are often preferred. An undercurrent is a broad sluice set at a heavy grade below the level of the main sluice. The fine stuff drops through a grating, while the coarse gravel continues on down the sluice. Refuse material from quartz, hydraulic or other mines is known as tailings. Tailings are deposited on a dump, which in the case of a hydraulic claim must be sufficiently spacious to receive the thousands of yards of debris deposited on it each day. When available a narrow, deep canyon, or a tunnel, may take the places of dumps. Quicksilver is used in the sluices, 14 to 18 flasks being used every fortnight in a long sluice. It is not placed in the last 300 or 400 feet. In working, keep the face of the bank "square." Washing should be carried on continuously. Watches must be set over the sluices, or gold is likely to be missed. As an extra precaution, the sluices should be run full of gravel before shutting off the water. There is no fixed custom regulating "clean ups." Some managers do so every 20 days, others run two or three months, others again clean up but once in a season. In large operations, the first 2,000 feet of sluice are cleaned up every fortnight; the remaining boxes once a year. Sluices are cleaned from the head downward, the blocks being taken up for that purpose. The amalgam of gold and quicksilver is collected in sheet iron buckets. The final step is reached when the amalgam is retorted and melted in a graphite crucible. The principle of which the hydraulic miner takes advantage is the great specific gravity of gold as compared with water and rock. To illustrate this quality it may be noted that on a smooth surface inclined at an angle of 1 in 48, subjected to a heavy stream of water, 95 per cent. of the fine gold in gravel does not travel three feet. The loss of quicksilver fed into sluices will vary, even under good management, from 11 per cent. to 25 per cent. of the amount fed to the boxes. 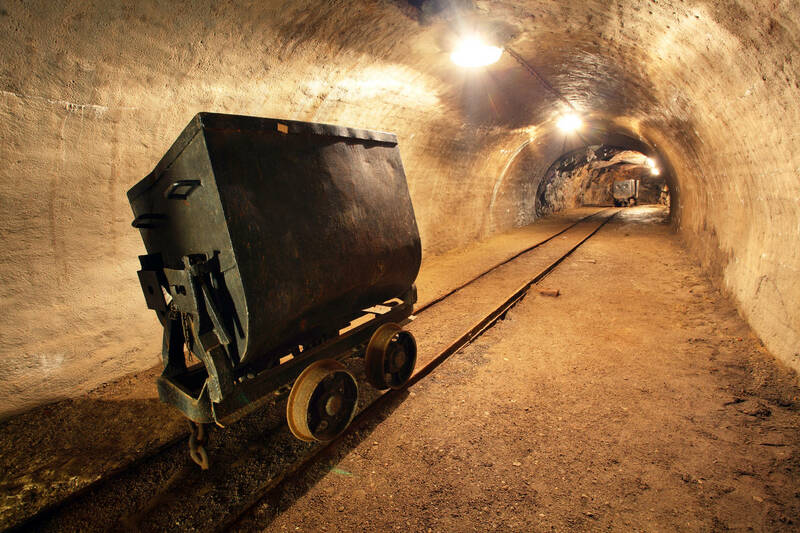 Hydraulic mines under favorable conditions are very paying investments. Gravel yielding 10 cents a cubic yard has been worked for 6 cents a cubic yard, at the rate of a million cubic yards a year. On another large claim 600,000 cubic yards were worked for 6 cents a cubic yard, yielding 13 cents a cubic yard. River dredging is another form of gold winning that has been brought to a great state of perfection in New Zealand. Although the dredge has not yet acquired the importance in America that was expected, it is successful on one or two western rivers, and as the subject becomes better understood it is conceivable that American mining engineers will be as successful in devising improved dredges as they have been in all other branches of their profession. In New Zealand the bucket dredge has proved more satisfactory than the suction dredge, although a hasty conclusion would probably give the latter the palm. 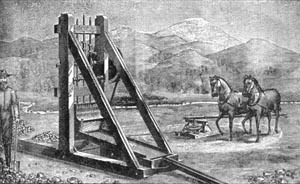 At Bannack, Mont., the Bucyrus Company has several dredges in successful operation. One is 102 feet long, 36 feet wide, and draws 36 inches of water. It is very substantially made, and weighs nearly 700,000 pounds. Before such a dredge is launched, a dam is built across the gulch to impound sufficient water. As the gravel is dredged and washed, it is dumped astern of the dredge, which, in the case of a shallow creek, moves up to the excavation made by the buckets. The boilers of this dredge are double, and together have 250 H.P. There are 36 buckets, and each one has a horizontal drag of eight feet, a capacity of five cubic feet, and travels at the rate of fourteen feet a minute. After treatment by trommels, or revolving screens, coppers, and sluices, and finally by a centrifugal pump, the now almost valueless gravel goes overboard again, leaving behind 98 per cent. of the gold it once held. The traction dredge is really a land-mining machine, as it is adapted for work on land nearly flat, where but little water is obtainable. The machine travels on bogie tracks. A 50-H.P. boiler supplies the water. A boom, 40 feet long, carries a shovel of 1.5 cubic yards' capacity, and moves 70 cubic yards each hour. "After great effort, numerous trials, many failures and some large losses, this system of gaining gold has been evolved from crude beginnings into a systematic and satisfactory method of mining. Dredging for gold is now attracting attention and bids fair to become an established form of mining for that metal. In New Zealand, where more work of this nature has been done than elsewhere, the evolution of the industry has been the work of years. The rivers upon which dredging operations are carried on are swift-flowing streams, subject to frequent floods, having a considerable depth of gravel, with boulders and runs of pay dirt interstratified. The conditions are, therefore, not the best for economical and successful work, and it is not surprising that many failures have occurred. The runs of gold are, however, often extensive and rich, and operations carried on upon such reaches have in a number of cases given satisfactory results. "The improved form of dredge is a double pontoon, with ladder and chain-bucket arrangement between. Screens separate the coarse from the fine material. Wide sluicing tables catch the gold, centrifugal pumps supply the water, and waste material is handled by elevators. The power is usually steam, although electricity is used in a few instances, where conditions are favorable. The dredges vary in size and capacity, but are now built of large size and great strength. Twenty thousand dollars is the cost of a large dredge with all the latest contrivances. Under favorable conditions, material has been handled without loss that only yielded a grain of gold to the cubic yard. The real cost in actual continued working is believed to be very much in excess of that figure where average conditions exist. "One dredge on the Clyde side of the Shotover, working to a depth of twenty feet below water level, lifted 40 tons per hour when operating. The profit on eleven dredges for the four weeks ending July 24, 1897, was an average of $2,686 for each dredge. "So far in this country (United States), with a few exceptions, dredging operations for gold have not been financially successful. From crude beginnings, however, the machines have been rapidly improved and perfected, until now, in some localities, dredges believed to be the most complete yet constructed are being put in operation, and results are promised, not yet attained, in the way of economical working and high percentage of saving. During the last few years, a number of dredges have been operated in California, British Columbia, Idaho, Montana and Colorado, but with poor success. Very few prove themselves capable of paying their way. Some of the machines were faulty within themselves, others were entirely unable to cope with the swift currents and large boulders of the streams upon which they were operated. This latter is said to have notably proved the case with the dredges tried upon the Frazer and Ouesenelle rivers. "Dredging operations on Grasshopper Creek, near Bannack, Mont., are now carried on successfully upon a large scale. The upper Sacramento river, in this state, has a dredge doing profitable work, and, in a small way, dredging is successful upon the Kzamath. A dredge upon that river, composed of two flat boats with a large steel scoop between, is able to cut and hoist the gravel and soft bed rock, and to handle boulders of from four to six tons' weight. The dredge is run day and night, has a 25-H.P. engine, and requires three men for each shift. In gravel 10 to 25 feet deep, 400 cubic yards can be handled every twenty-four hours. Cost of dredge, $8,000. "A large dredge of the chain-bucket variety is operating in Northern Mexico, in a dry country, where there is little water. The actual capacities of these machines are 60, 100 and 150 yards per hour. "Perhaps the most interesting dredge yet brought to the notice of the public is one lately built by the Risdon Iron Works, San Francisco, and now operating upon the Yuba river, near Smartsville, Cal. It is of the elevator, or chain-bucket, type, 96 feet long, composed of two pontoons, separated by a space five feet in width, in which is operated the ladder carrying the buckets. One man controls the dredge by means of a power winch with six drums. Four drums carry lines from the corners of the dredge to anchorages on shore--one a head-line and one the ladder line. The machine is to dredge to a depth of 45 feet, and is said to have a gross capacity of 93 cubic yards per hour. The material discharges from the buckets into a revolving and perforated screen. This segregates the large material, which is then conveyed away by the tailings elevator. Water (3,000 gallons per minute) is supplied to the revolving screen for washing and sluicing purposes by a centrifugal pump, and the fine stuff falls through the holes in the screen into a distributing box, from which it passes to a set of gold-saving tables and thence to a flume. The tables are covered with cocoa matting and expanded metal. The top tumbler of bucket-chain is operated by a vertical compound condensing engine indicating 35 H.P., which also operates the pump. It is claimed for this dredge that in any ground not deeper than 60 feet below water level or more than 20 feet above, and which contains boulders of not more than one ton weight, the material can be handled at from 3 to 5 cents per cubic yard. 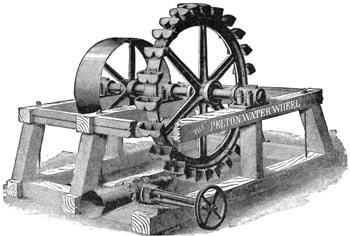 If the capacity of the machine is given without deduction for water raised, imperfect filling and general delays, and the increase in volume of the gravel when broken up in filling the buckets, the actual working capacity would be less, and from these causes and the losses from wear and tear, breakages and repairs, the cost of operating would be increased. The cost of the dredge complete upon the river is said to have been $25,000. "In the evolution of the dredge into the elevator or chain-bucket machine, now the popular form, the various kinds of dredges were given trials. The dipper dredge is not adapted to dredging for gold, and some of the gold is lost. With agitation of the gravel the gold soon settles and is not recovered. It is also very difficult, if not impossible, to construct a dipper dredge that is water-tight. Another objection is that the material is supplied intermittently, thus making necessary certain undesirable arrangements for supplying the material in a continuous flow to the gold-saving tables. The same objections apply with greater force to the clam-shell form of dredge. It is by no means water-tight, and loses most of the gold in the act of dredging and bringing up the gravel. The objections would seem not to have the same force if applied to hard cemented gravel or to gravel with sufficient clay or other binding material to make it consistent. It is well to remember that these forms of dredges are, in many positions, economical of operation. "The hydraulic dredge has had fair trials and proved a failure. Large storms greatly lessen the efficiency of this form of dredge, and numerous boulders hamper the pumping work. The suction force, being intense near the pipe and decreasing rapidly a short distance away, causes the sand and gravel to be carried off, leaving the gold behind. A centrifugal pump is therefore of little use to catch coarse gold, or to clear a hard, uneven bottom. Cutters do not remove the trouble, since the gravel is dispersed by the cutting, and the gold is separated therefrom. "These objections would not obtain under certain conditions, and it would seem quite possible that conditions might be found existing where the suction dredges might be arranged to do good work. A dredging company is now constructing, at Seattle, two dredges of the suction type to operate upon the Yukon river. This would indicate that there are those who believe that deposits occur in and along that river which can be successfully worked in this way. 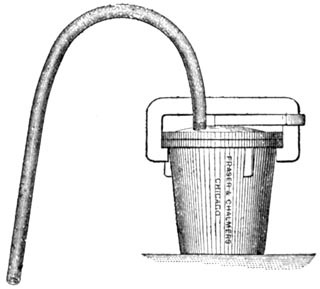 "The chain-bucket machine, the popular form for operating under average conditions, is a combination of the following elements: An excavating apparatus which clears the bottom and handles the material with little agitation and slowly and continuously delivers a regular quantity of gravel to the gold-saving appliances; revolving screen to receive and wash the material and separate the coarse from the fine; an elevator or contrivance for carrying off the coarse gravel and stones; gold-saving arrangements, or tables, over which the fine material passes and upon which the gold is caught; a pumping apparatus to supply water for washing and sluicing. "The proper capacity of a machine seems to be regulated by the capacity of the gold-saving appliances. The tables should be as wide as possible, with frequent drops, and the fine material should be distributed over the tables in a thin film. The tables are covered with plush or cocoa matting, and sufficient water supplied to keep the material clear. The material should be supplied evenly, continuously, and regularly to the tables. Care and attention are required to catch the fine gold. A disregard of the foregoing directions results in great loss, more particularly in the fine gold. Mechanical skill is required to properly design and construct a dredge, and the care of a competent mechanic is necessary to see that the machine is kept in order and economically operated. The saving of the gold, however, is what makes dredging operations a commercial success. A man skilled in these matters should be in charge of running operations. Dredges should be built of determined capacities, and should be designed to suit the conditions under which they are to operate. Careful examination and investigation of the ground to be worked should be made beforehand, and the surrounding conditions studied, and it goes without saying that these matters require engineering skill and experience. "The field for dredging for gold seems large. Where the proper conditions exist, it is a system which commends itself, and which gives promise, in competent hands, of being an economical method of mining. There is probably a very large extent of country where dredging for gold will be carried on profitably. The ground need not be in a river, if there is seepage water sufficient to float the dredge and supply clear water for the saving of the gold. Dredging requires little water as compared with that required for sluicing and elevating, and this water can, in many dry localities, be supplied at small expense, where a supply for hydraulic work or elevating would cost a very large sum, or be impossible at any cost. Any power suitable for driving the prime motors can be utilized to run the dredge. Indeed, it would seem as if a system of mining was about to be perfected which may make possible the profitable working of many deposits not easy to be worked by other methods, and which may, in many instances, solve problems regarding the successful working of deposits which hitherto have seemed most perplexing and even impossible of solution. Some doubt exists as to possible economical dredging operations under the water of torrential streams. The strong currents, the frequent floods, and many large boulders found in the channels of such streams make the working of the machines difficult and costly. This would not be so much the case in the long stretches of less current, nor would it be so at all in the valley-like reaches in the lower portions of rich streams, nor in the wide, flat portions of country where the streams enter the plains." Very few gold-bearing lodes contain nothing but free gold; on the contrary, they carry the bulk of their values in the form of sulphurets, having more or less gold incorporated, and even when the gold is native and free-milling at the surface, it is generally changed into sulphurets as depth is gained. So the miner has to consider methods of recovery more complicated and expensive than simple amalgamation with mercury, for upon gold included in pyrites mercury has no effect. Titanic iron, hematite, and tungstate of iron often hold gold, or soft clay ores carry it in their midst, and such combinations tax all the skill of the mining engineer merely to save a respectable percentage of the assay value. Sometimes chlorination and sometimes cyanization are the measures tried, but supposing the preliminary treatment to have been by stamps in the battery, concentrating is one of the main reliances of the mill man. The blanket table is undoubtedly the oldest type of concentrating machine, but it is very inferior to modern inventions. Percussion tables often do good work. 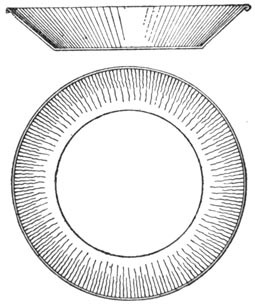 In this system a sharp and frequently repeated blow is given the table, in such fashion as to make the heavy material separate from the light. "Shaking" and "rocking" tables are favored in some mills, and they give better results on fine gold than any of the previously mentioned devices. But the best machine so far invented is the Frue Vanner--an endless rubber band drawn over an inclined table, having both revolving and side motions. The lighter particles are carried off by water, and the heavier collected in a trough. Veins, lodes, or ledges, may be found in stratified or unstratified rocks, and in the former they generally cut the beds at an angle. Veins are bounded by walls. The rock in which a vein is found is a country rock. Smooth walls are called "slickensides." The upper wall of an inclined vein is the hanging wall; the other the foot wall. A layer of clay between the veins and wall is a selvage. A mass of rock enclosed in the vein is a horse. The vein stone, or gangue, is all that part of a vein that is not mineral. The throw of a fault in a vein is measured by the amount of vertical displacement. When the miner comes to a fault, he should follow the greater angle in his attempt to recover the lode. 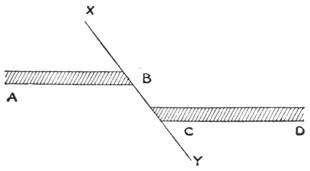 For instance, on mining along A B to the line of fault X Y, the exploration will be continued downward, because the angle A B Y is greater than the angle A B X.
Mercury that has been "sickened," that is to say, has lost its brightness and power of amalgamating, may often be cured by washing with an extremely weak solution of sulphuric acid and adding a little zinc. As regards the comparative merits of chlorination and cyanization, it may be said the one is the equal of the other. Under certain conditions, chlorine gives a higher percentage of gold; under others the same may be said of cyanide. A description of either process would be out of place, however, in a simple elementary work. Handed down through the centuries, the primitive arrastra is still useful in certain contingencies. It is like a cider mill in its principle, and was probably suggested by recollections of that machine, or else of the Spanish wine-press. A circular, shallow pit, a dozen feet or more in diameter, is first paved with hard, uncut stones of granite, basalt, or other hard rock. This pavement is a foot thick, and beneath it is a bed of puddled clay 6 inches deep. A vertical shaft with an arm, or arms, revolves in the center of the arrastra. Grinding blocks weighing 400, or perhaps even 1,000 pounds, are fastened to the arms by chains or rawhide strips. The forward part of each stone is raised a couple of inches off the floor. Mule, horse, water or steam power may be used, the speed ranging from 4 to 18 turns a minute. Nothing can be simpler, less expensive, or save a greater proportion of the value in the ore than the arrastra. Its limited capacity is its worst fault. An arrastra 10 feet in diameter will treat 500 or 600 pounds of ore at a charge, and handle one ton a day of 24 hours. Ores that were so poor they yielded nothing to the stamp mill have paid well with the arrastra. This humble device may be used to advantage, probably in some of the poorer gold-bearing cemented gravels of the Northwest. The ore should be crushed to pigeon-egg size. Small quantities of mercury, about a tablespoonful to every five tons of gravel, has been found a satisfactory proportion in California. In a permanent arrastra a layer of neatly-dressed and pointed stones is laid in hydraulic cement. A fair-sized arrastra will require 50 pounds of quartz to charge it, and the material must be broken into pigeon-egg size. After the machine has been started, and a little water added from time to time, little else need to be done for four or five hours, and this is perhaps one of the reasons for which it has always been so favored in indolent Mexico. At this stage, the quartz and ore will be very finely pulverized, and water should be added until the pulp is as thin as cream. Quicksilver must now be added in the proportion of 1-1/4 ounce for every supposed ounce of gold in the ore being treated. Two hours' further grinding is given, and water then admitted until the paste is quite thin, the speed of the arrastra being reduced at the same time so as to allow the amalgam and quicksilver to sink to the bottom. A half an hour of this treatment suffices and the thin mud is run off, leaving the gold and amalgam on the floor of the arrastra. A second charge of broken quartz is put in and the operation repeated, the clean-up not taking place oftener than every ten days, and sometimes only at intervals of a month or so. The rougher the bottom the longer the interval between clean-ups, as all the stone work must be taken up each time and all the sand and mud between them must be washed carefully. The arrastra is extremely valuable to the poor man who, having discovered a gold-bearing vein, wishes to transfer some of the metal into his own pocket, at the least possible outlay. Its cheapness places it within reach of all, while a stamp will cost a good deal. Then again the amalgamation being more perfect in the arrastra than in any other mill, it is particularly suited for the poor, lean ores. It is, however, only adapted to those that are free-milling, others not being suited to this form of apparatus, nor, indeed, to any save very costly plants. Some arrastras have been built to treat old tailings, and have paid well when water power could be used. Free-milling gold and high-grade silver and gold ores are those usually treated. The flagging should be of tough, coarse rock; granite, basalt or compact quartz are all good. This flagging should be at the very least a foot thick. When the arms of a 10-foot arrastra are revolving 14 times a minute, the outer stone is traveling 400 feet a minute. Round holes closed by wooden plugs, or a side gate, lets the liquid mud out. Some mill men use chemicals in the arrastra; potassium cyanide, and wood ashes or lye are probably the most useful, as the latter cuts grease and the former gives life to the quicksilver. Rich silver ores are treated with blue stone and salt. When the pulp has been ground sufficiently, quicksilver is added, sometimes 250 pounds being put in a single charge. A 12-foot arrastra will never treat more than two tons a day, and often no more than one-half that. One man a shift can look after a couple of arrastras, and the owner, in case of one arrastra that is working on tailings, often does everything himself. Overshot wheels, or turbines, or hurdy-gurdies, furnish the power in many cases. A simple mule-power arrastra may be built for $150. A side hill should be chosen for the site of a battery. Ample water power is necessary, though provision may be made for saving it in catch basins should such a course be desired. Moreover, there must be plenty of room below the mill for the tailings, as it may be desirable at some future time to put them through a second course of treatment. Automatic ore-feeders are always put in by good mill men. In cold climates the water that goes through the mill should be heated, and this may be done by the exhaust steam, but care is necessary that no grease get into it, as it would prevent the gold from amalgamating. The stamps for a light mill may be 3 or 5 in number, and weigh from 700 to 850 pounds. Tables must be water-tight, with half an inch to one inch drop to the foot, according to the fineness of the gold. Below them tables, having the same inclination and covered with blanketing, are used to retain specks of gold that have passed over the plates without amalgamating. After the concentrated materials, always spoken of as the concentrates, have passed over the tables, they are often roasted to get rid of the sulphur, arsenic, etc., and afterwards treated with quicksilver in the pan, or tin, with chlorine or cyanide. These processes belong, however, to the domain of the professional chemist and metallurgist, and require the knowledge and experience of an expert to stand a chance of success. The coarseness of the mortar screens is subject to infinite variety, according to individual preference. The number of holes to the square inch ranges between 60 and 800 in Australia, and between 900 and 10,000 in the United States. The holes, when round, agree in numbers with those of sewing-machine needles, from 0 to 10. When slots are preferred to holes, they are generally 3/8-inch in length and No. 6 diameter. Russia sheet iron, or sheet steel 1/32-inch thick is the material of which they are made. It should weigh one pound to the square foot, be very soft and tough, have a clean, smooth surface, and show no rust or flaws. In Australia 1/16 sheet copper is preferred. The holes in any case must be punched in the sheet so that the rough edges are turned, and thus any pulp that finds its way into one of the holes is certain to get out again and not clog. A battery may require 13 sets of screens a year; each screen having a surface of about 1-1/2 square feet. Russia iron screens endure 15 to 40 days. As the work a stamp can do depends entirely upon how much pulp can escape through the screen in any given time, the latter is evidently a very important detail of a battery. Prospecting stamp batteries differ from ordinary batteries, chiefly in being of light build and weight. Amalgam coming from battery stamps is often mixed with all sorts of rubbish. After being gathered, it is dried with a sponge, foreign matter picked off the surface and clean quicksilver added. Soft unglazed paper thrust into the mercury removes the last vestiges of water, and then a card is drawn vertically or a piece of blanket horizontally across the mercury to clean it of iron. After squeezing, the amalgam is retorted. All the amalgam is placed in one large kettle and, if possible, the latter is put on a strong table having an inclined surface with a groove and hole at the lower end to catch any stray globules of quicksilver. Sodium amalgam, one ounce to each 75 pounds of mercury, is put in the amalgam kettle and the whole stirred. This sodium amalgam is not absolutely necessary, but is desirable. After some minutes, water is poured on the mercury and the whole stirred. All dirt rises to the surface and is removed with a sponge. The cleaning is continued until the mercury seems absolutely free from any impurity, when it is dried with a sponge. It is next turned into pointed bags of stout canvas and force applied until most of the quicksilver has squeezed through. The amalgam remains behind. The quicksilver still contains some gold, but it had better remain if the mercury is to be used again, as gold attracts gold; it can always be recovered by retorting. Sodium amalgam is best made by the miner himself, enough for one clean-up at a time. Metallic sodium and quicksilver are the necessary ingredients; the former being kept in a wide-mouthed bottle covered with coal oil. A frying-pan makes a useful mixer. It must be dry and clean. Five pounds of clean mercury is poured into the pan, and dried with a sponge, and heated beyond the boiling-point of water, but not much above, or there will be a sensible loss of mercury. A piece of sodium is wiped dry, cut into 1/2-inch squares and placed with a long pair of tongs in the center of the warm quicksilver, which, by the way, is now off the fire and in the open air, the operator meanwhile keeping religiously to windward of it, unless he courts salivation and all its attendant ills. As soon as the sodium touches the mercury a flash and mild explosion will follow, but after a few cubes have been introduced into the frying-pan, always in the center, this will cease. As soon as a solid mass of amalgam forms in the middle of the pan, the contents must be stirred slowly, and a little more sodium added. The whole mass now crystallizes out, and if put into closely-stopped bottles it will keep without further protection for a little time. Once opened, each bottle must be used. Observe all these directions faithfully, then there will be no danger of inhaling mercurial fumes nor of being blown to atoms. After the amalgam is once made, it is safe as sugar. In retorting amalgam never fill the flask too full, and apply the heat gradually, and always from the top of the flask downward. The rocker is a box 40 inches long, 16 inches wide on the bottom, sloped like a cradle, and with rockers at each end. A hopper 20 inches square and 4 inches deep, having an iron bottom perforated with 1/2-inch holes, occupies the top. A light canvas-covered frame is stretched under this, forming a riffle. Riffles, and occasionally amalgamated copper plates, are placed in the bottom. The gravel is fed into the hopper, the cradle being then rocked by one hand while water is fed by a dipper with the other. The cradle must be placed on an inclination while being worked, and under the influence of the continued side-to-side rocking the dirt is quickly disintegrated, passes through the riddle and falls on the apron. From the apron it is conveyed to the inner end of the cradle floor, from which it flows over the riffles, or bars, and out at the mouth. The difference in level of the floor is generally about 2-1/2 inches, but this may be varied according to the nature of the dirt treated. Large stones in the riddle or hopper must be thrown out, but smaller ones assist in breaking up the lumps of dirt. Every little while the pebbles are turned out and looked over for nuggets. Clean-ups are necessary two or three times a day. The hopper is taken off first, then the apron is slid out, and washed in a bucket or tub containing clean water, and finally the gold and amalgam are collected in an iron spoon from behind the riffle bars, and panned out. Gravel requires at least three times its own weight of water to wash it. The most convenient way is to lead the water from a stream through a pipe discharging directly over the hopper, but this is, of course, impracticable in some places. More often the water is led to a little pit on the right hand side of the operator, from which he ladles it up as required. One man can wash from one to three cubic yards daily according to the character of the dirt, but every time he stops the machine to feed it with gravel or to empty the riddle, the sand will pack, and must be removed before washing can go on. Two men can wash nearly three times as much dirt in a day as one man. 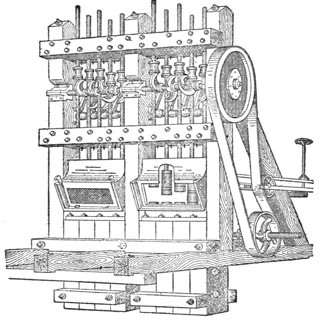 But in any case, the rocker is only a primitive machine, having a capacity but one-fifth as great as that of the Long Tom, and but one-tenth that of a very poor sluice, but as it is cheap, requires but little water, and saves a high percentage of coarse gold, the rocker will continue to be used in many districts. 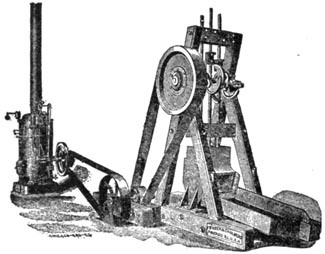 The Long Tom was invented many years ago by Georgia miners. It is a trough 12 feet by 15 to 20 inches at the upper end, and 30 inches at the lower, and 8 inches deep. The grade is usually 1 in 12. A sheet iron plate forms the lower end of the trough. These figures refer to the upper trough. 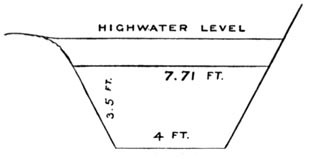 The lower or riffle-box is 12 feet long by 3 feet wide, with a fall equal to that of the trough and a sufficient depth to keep the material and water from spilling over the sides. It should have four riffles. For this means of saving the gold, to work satisfactorily, the metal must be coarse and the water plentiful. Every sluice is an inclined channel through which flows a stream of water, carrying away all the lighter matter thrown into it, and separating it from the heavy. When the operations would not be permanent enough, or sometimes for other reasons, a ground sluice is preferred to the ordinary box sluice made of boards. Ground sluicing requires, however, six times as much water as does a box sluice to do the same amount of work. It is simply a gutter in the bed rock, and if the bottom is hard and uneven its inequalities will arrest the gold; if not, a number of boulders too heavy to be moved by the stream are put into the sluice to act as riffles. No mercury is used. The water is turned off and the collected coarse gold washed in the pan. Sluice boxes may be any length, from 30 to 5,000 feet. They vary in width from 1 to 5 feet, though generally 16 or 18 inches. The grade is proportioned to the fineness of the gold, varying from 8 inches to 2 feet to the 12-foot box or length. The bottom should be of 1-1/2 inch plank, and the sides of 1-inch boards. The boxes are made 4 inches wider at the upper end than at the lower, so as to telescope. The best method found yet for arresting fine gold is the copper plate amalgamated with mercury on its face. These plates are never used at the head of a sluice or other situation where there is much coarse gold, as they would be superfluous in such a situation, but are placed some distance down the sluice and are most efficacious in arresting the "flour," or excessively fine gold. Plates are always of copper above 1/16 inch thick, and may be 6 feet or more long, and of a width suited to the capacity of the sluice. When treated with quicksilver, they become as brittle as glass, and must be handled with care. The copper plate is first washed with a weak solution of nitric acid, and then mercury that has been treated with a weak nitric acid solution is rubbed on the plate. As this surface of quicksilver wears off, it may be replaced by a little fresh mercury. Any green slime on a plate is an evidence of copper salts in the water. It must be scraped off and the spot rubbed with fresh quicksilver. Gold attracts gold, therefore the plates should not be cleaned up too often. Copper plates may be freed from gold by heating them over a fire and causing the quicksilver to evaporate slowly. The plates, after being cooled, are rubbed with dilute muriatic acid and covered with damp cloths for one night. They are then rubbed with a solution containing salt peter and sal ammoniac, and once more heated over some hot coals, but not allowed to get red hot. Soon the gold scale rises in blisters; the plates are then removed from the fire and scraped. Those parts of the plates that have not yielded up their gold must be re-treated and fired until they do so. All these scales of gold are then collected in a porcelain dish, the base metals are dissolved out with nitric acid, and the gold is then smelted. Corrosive sublimate should be placed in the crucible as long as any blue flame is seen to come from it. Some mill men prefer to amalgamate their copper plates with silver amalgam, claiming that silver-coated plates save a higher percentage of gold. To amalgamate in this way take some silver bullion, or silver coin, and dissolve in weak nitric acid, only just strong enough to act upon the silver. (If you use too much nitric acid you will waste mercury and make the amalgam harder than it should be for the best results.) After crystals have formed, quicksilver must be added, heating gently meanwhile, until a thick, pasty amalgam has formed. Let this new compound stand for some hours, and squeeze through chamois as usual. The proportion of silver may be about 1 ounce to the square foot of copper to be plated. In facing new copper plates with this amalgam, they should be washed first with dilute nitric acid; then in clear water; the ball of amalgam being rubbed over their surfaces, some little force being applied. Plates should not be used for 24 hours after coating. Porous copper plates of the best quality, and not too heavily rolled, should be used. Follow the amalgam with a swab, and rub the alloy well into the plate. Zinc amalgam (preferable when mine water containing sulphuric acid is used in the battery) is applied to the plate after it has been cleaned with a moderately dilute mixture of sulphuric acid and water. The zinc-quicksilver ball is rubbed in and applied while the plate is still wet. Zinc amalgam is prepared as follows: Cut zinc-sheet into small pieces; wash in weak sulphuric acid; and dissolve in mercury. When the quicksilver will take no more zinc, squeeze through chamois and rub in. Zinc-coated plates should stand a week before being used. Very weak sulphuric acid will always clean these plates of any scum that may form before they have received a gold coat. Sometimes the miner will be troubled with impure gold after retorting. If the metal is very dark this shade may come from the presence of large amounts of iron. A heavy proportion of mineral salts, such as chloride of calcium (CaCl), sodium (NaCl), and magnesium (NgCl2), in the battery water sometimes accounts for this. In such cases amalgamate, retort, pulverize and roast. Then smelt with borax, the iron passing into the slag. If necessary smelt a second time, when the gold should be pure enough to dispose of. In extreme cases, the gold may weigh but one-fifth of the amalgam treated. In districts where sufficient water for sluicing is not procurable, dry washing is resorted to. Nothing but rich, coarse gold can be worked by this method, and the dry washer rarely delves far below the surface for his gold. In the Mexican deserts the dirt is laid on raw hide, all the large pebbles picked out and the sand rubbed as fine as possible between the hands. The sand is placed in a batea and winnowed by tossing in the air, the lighter material being blown to leaward and the heavy gold falling into the batea. 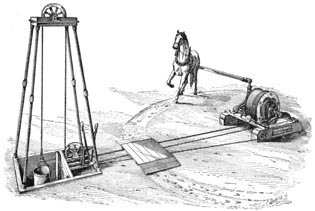 A form of winnowing machine has been patented, which may be driven by horse or hand-power, which is said to give satisfaction. It works by forcing a strong blast of air from a fan through a canvas screen. The inventor claims that it will do the work of three men, and work dirt for 2-1/2 cents a cubic yard. When there is a tendency in the material to cake, dry washing is impossible.